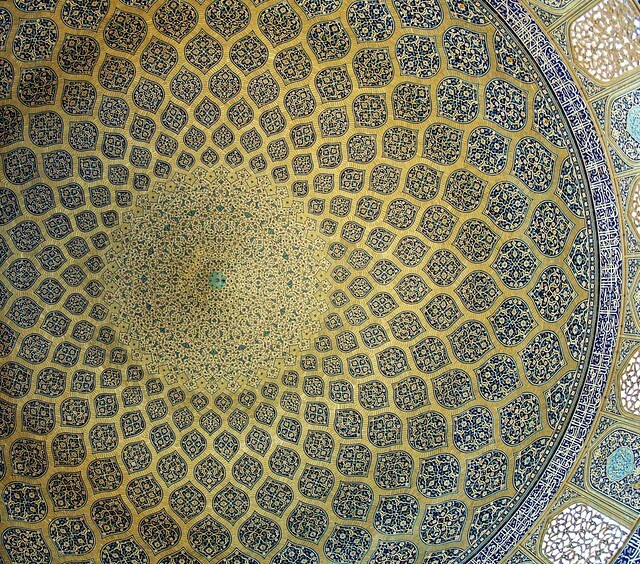 dome, lotfollah mosque, isfahan oct. 2007 | Flickr - Photo Sharing! sheikh lotfollah (or lutfallah or lotf allah) mosque, isfahan, iran, 1602-1619.
architect: muhammad reza ibn ustad hosein banna isfahani. consider the cool geometric mastery and inventiveness behind the ornamental incrustation of the dome. sheila blair and jonathan bloom write, "the apex of the dome is filled with a giant sunburst, from which descend tiers of ogival medallions filled with floral motifs, which swell in size with the curve of the dome". I like this description even if I had to look up ogival. pope wrote, less objectively, "the chamber is entirely empty. any appurtenances would have been superfluous and quite overwhelmed by the powerful forms and commanding colors. this is pure architecture, flawless and serene, and still as perfect as on the day of dedication three hundred years ago". guess he liked it. this language is very typical of pope's introductions and (apart from the word appurtenance) it doesn't teach you much. ZhengHe, Doctor Casino, tsaaby, and 214 other people added this photo to their favorites. amazing picture, beautiful mosque, breath-taking dome. May I please use this image for my display pic on facebook etc.? I have visited Isfahan at least 5 times but never stepped foot inside any of the mosque. I avoided them on purpose though. I'm Iranian but in all my life I've only been to a mosque once and that was when I was a baby. Somehow I couldn't even convince myself to visit historical mosques such as this one. Your pics have really changed my mind though (or maybe I'm getting a bit more mature lol). I could think of a number of reasons, historical and contemporary, not to visit the mosques, but as an architect, I know another list of good reasons to go - I hope I have shown some of them here. outside prayer, the mosques were open for cultural tourists like us and walking around these enormous buildings felt very natural. if you feel ready, you should see them next time you are in isfahan. it is. I recommend going to isfahan. Hello your picture is awesome! I'm Ting, I work for a travel agency and now planning a trip to Iran and going to visit this mosque. Is it possible to use your pic on our website?